People can be so messy — but litterbugs beware, this dog's on the job. A helicopter crew from Brazilian news outlet Globo was in the skies over Sao Paulo when they encountered a rather surprising scene taking place. 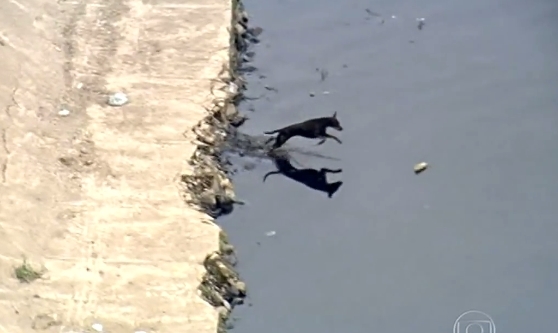 There, along the concrete banks of an urban river, a solitary black dog was spotted single-pawedily clearing the waterway of floating plastic debris. And, from the looks it, he was having a blast doing it. For some 20 minutes while the cameras rolled, the cleanly canine leapt and pounced at improperly-discarded plastic bottles, dutifully carrying them back to the shore. All told, the news crew counted 25 bottles salvaged from the river, thanks to the dog. Responses to "Stray Dog Spotted Cleaning Trash From River (Video)"
That is such a special dog to do that. People should take a lesson from him. I hope he gets a permanent home. May God bless & be with that wonderful dog.